The Ancyloceratina were a diverse suborder of ammonite most closely related to the ammonites of order Lytoceratina. They evolved during the Late Jurassic but were not very common until the Cretaceous period, when they rapidly diversified and become one of the most distinctive components of Cretaceous marine faunas. They have been recorded from every continent and many are used as zonal or index fossils. The most distinctive feature of the majority of the Ancyloceratina is the tendency for most of them to have shells that are not regular spirals like most other ammonites. These irregularly-coiled ammonites are called heteromorph ammonites, in contrast to regularly coiled ammonites, which are called homomorph ammonites. In the more primitive forms, the shell departs only slightly from being a perfect spiral, with only the last, outermost whorl being open, forming a hook underneath the main spiral. In such forms the spiral was the chambered, buoyant part of the shell, and the hook was the living chamber in which the soft body of the ammonite resided. Examples of such types were Ancyloceras, Protanisoceras, and Tropaeum. The more advanced heteromorphs departed from such forms radically. The shells of Ptychoceras consisted of three or four shafts squashed together and connected with tight, 180 degree bends. Members of the genus Hamites were much larger but had a similar sort of shape, though the shafts were open so that the whole thing looked rather like a bigpaper clip. 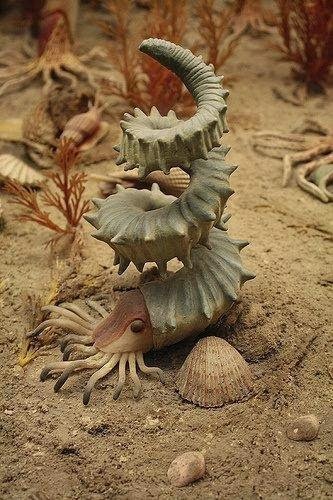 Helioceras heteromorph ammonite, Una maravilla de la naturaleza, esta extraña criatura era un tipo de ammonites del suborden Ancyloceratina que Vivieron durante los períodos Jurásico y Cretácico.